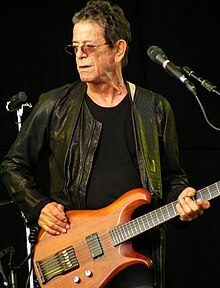 Lewis Allan "Lou" Reed (Mairch 2, 1942 – October 27, 2013) wis an American muisicker, sangster an sangwriter. He wis the guitarist, vocalist, an principal sangwriter o the Velvet Underground, an his solo career spanned five decades. ↑ Roberts, Chris (2004). Lou Reed: Walk on the Wild Side: The Stories Behind the Songs. Carlton Books. Retrieved September 28, 2014. This page wis last eeditit on 9 Apryle 2017, at 04:21.